On our first visit to Poland, we visited the historic city of Krakow. From there we drove 60 km to the town of Oświęcim. A few years earlier we had visited the concentration camps Buchenwald and Sachenhausen in Germany, the holocaust memorial Yad Vashem in Jerusalem and the national holocaust monument in Berlin. So what made us visit yet another such gloomy place? Francien and I wanted to better understand our own recent history, compare the most infamous concentration camp with what we had seen already and not the least to put this all in perspective with current atrocities taking place around the world. 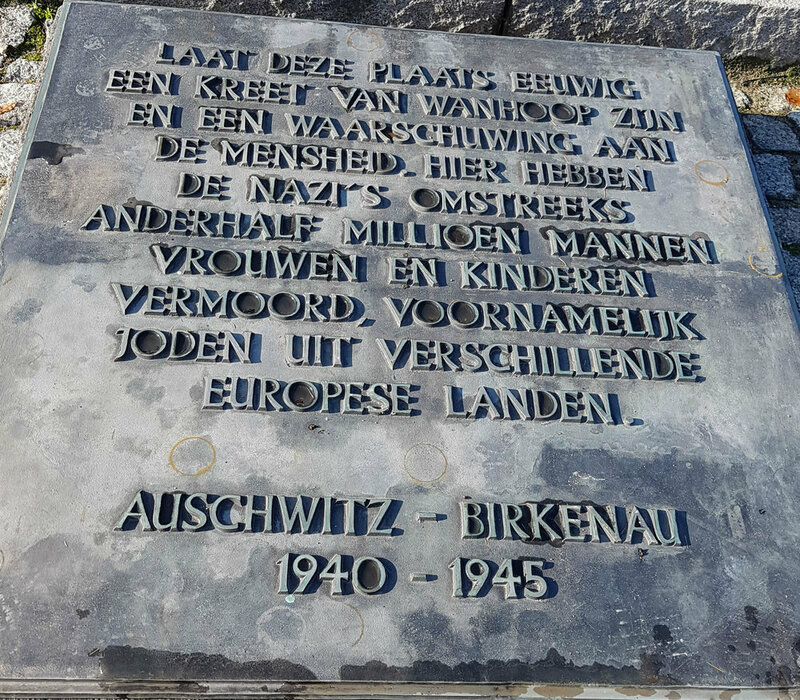 Those places left somber memories and with that in mind we visited the Auschwitz-Birkenau concentration camps. It was a crispy cold day with blue skies and we were fortunate enough to beat the tourist crowds in the early autumn morning. Together with our Polish guide we walked through the main gate underneath the wrought iron banner ‘Arbeit Macht Frei’ (work makes free). My first impression was that it looked smaller than what I had expected from the many times I had seen this on pictures and documentaries. 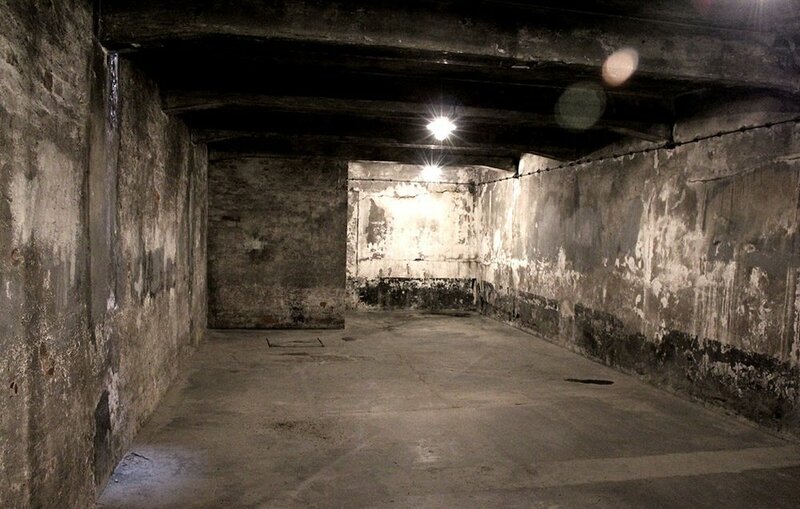 We walked in stunning silence through the grim red brick barracks, the infamous Block 11 building were the Gestapo tortured people in starvation cells, suffocation cells and stand-up cells. In another building we saw the clinic where the medical experiments were done and passed the execution wall. We stood humbled in front of the gallows and walked silently inside an underground gas chamber and passed the furnaces in one of the crematoriums. The rooms with the victim’s personal belongings were certainly the hardest to visit: the piles of shoes, eyeglasses, combs and suitcases taken from them and the hair cut from their dead bodies (use by the Nazi’s to make socks and carpets!). It all personified this experience, reminding me of the emotions we felt when we visited Yad Vashem. Inside those cold and depressing buildings, it came home, it had a very human and harrowing feeling. Everyone who has visited this place will agree: it is shocking! Did the size, closed streets and heaviness of Auschwitz I compare with what we had seen before in Buchenwald, Birkenau (a separate camp 4 km from Auschwitz I) was simply overwhelmingly large, with acres of grass, cut in the middle by two parallel railway tracks. Auschwitz I concentration camp was a moving experience, but to describe Birkenau is difficult. We stood at the rail tracks where the selection between those who had to work and had to die immediately (after the victims arrived in cattle rail-cars) took place. Wooden barracks as far as the eye could see (there used to be 200, housing 800 -1000 prisoners each), double barbed electrified fencing with wooden watch towers made any escape all but possible. Everything was so clinical, so organized, it wasn’t emotional. I felt a clinical detachment as the design was built specially as an industrial complex to exterminate people: on one side of this 40 square kilometer complex the people were brought in by rail-car and most of them were burned in crematoriums one kilometers across the opposite side. I tried to compare all this with what Francien and I had seen in Jerusalem and Buchenwald. But the camp Birkenau was different though, the cold methodology behind its design, construction and use was scary. The International Monument, were heads of state commemorate the victims of the holocaust, is a large area of wide steps located between the ruins of two such gas chambers. It is a simple jumble of dark stones with a row of twenty granite slabs in front of it. Each slab has an inscription in a different language. A humbling place for reflection. Similar to the national holocaust memorial in Berlin, this monument itself doesn't mean anything, it merely represents something incomprehensible. Considering this all happened only 70 years ago, it struck me then and there, that we all had not learned from this catastrophic event. Our planet at large remains fraught with fault lines and divisions. Too many wars and brutalities are still around us! When I saw the rail track on which one million people were transported to the gas chambers, I saw the refugee flows on TV marching in Europe, Africa, the Middle East and Asia. I thought back to the ethnic cleansing, which only recently took place in Bosnia and Ruanda. Didn’t Stalin kill millions of people in his infamous Gulag Archipelago just after the WW II?! A few years ago, travelling from Amman to Petra in Jordan, we drove passed the Palestinian refugee camps on the scorched desert hills only a few kilometres from their homeland. In 2016, we walked in Cape Town through illegal settlements where refugees from Zimbabwe eked out a living, with little hope to ever return to their homeland. And those Rohingya refugees we visited in Kuala Lumpur earlier this year are more or less our neighbours. Is that what I was witnessing in Auschwitz much different from what has occurred in our recent history and indeed is still happening? Not really. The extermination of people on an industrial scale made the holocaust unique in its form, but those modern-day refugees are simply fortunate enough to escape being systematically murdered because of the similar ethnic, racial or religious reasons. This visit made me aware again what human beings were capable of doing to each other and still are capable of. Déjàvu. In 1996, I worked in the former Buna Werken close to Leipzig, eastern Germany. Those red brick buildings in Auschwitz I camp looked much like the administration buildings my office was in, six years after the Iron Curtain was dismantled. When Francien and I drove back to Krakow, we saw adjacent to Birkenau, the smoking columns of some still operating Buna Werken plants (Monowitz). It reminded me of that time in Leipzig. Those facilities had a same history, built and operated for the same Nazi war efforts by slave laborers supplied by another concentration camp: Buchenwald. A personal full circle after more than twenty years. It was not a comfortable visit, but it helped us further understand (is that possible?) why it is so important to keep reminding the next generation what has happened. It is more important than ever that we all interact with unfamiliar cultures, religions and ideas to bridge those divides which cause(d) so much suffering. As sad as this blog-post is, it can serve as a warning into the future for all of us.